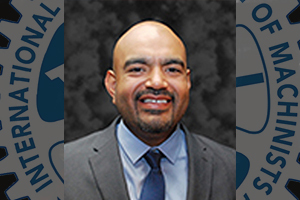 IAM International President Robert Martinez, Jr. has appointed Jorge Bonilla from Houston Local 811 as an Education Representative at the William W. Winpisinger Education and Technology Center in Hollywood, MD, effective August 20, 2017. Bonilla, a union activist for nearly 20 years, comes to the Winpisinger Center with great experience as an activist, organizer and servicing representative in the air transport sector. Bonilla has been a member of the Spanish Leadership Working Group at the Winpisinger Center, and has been involved in reviewing, translating, developing and delivering the leadership programs in Spanish. Before be elected Assistant General Chairperson at District 141 in 2014, Bonilla was elected as Grievance Committee Chairperson of the newly formed Local 811. He also served on the negotiating team that negotiated the amalgamated agreement at the new United Airlines. As an Assistant General Chairperson, Bonilla was responsible for handling grievance reviews and arbitrations for Ramp Service and Customer Service employees at several different United Airline negotiations. Bonilla’s union activism began at Continental Airlines in 1998 where he joined the IAM in-house team working to organize the carrier.